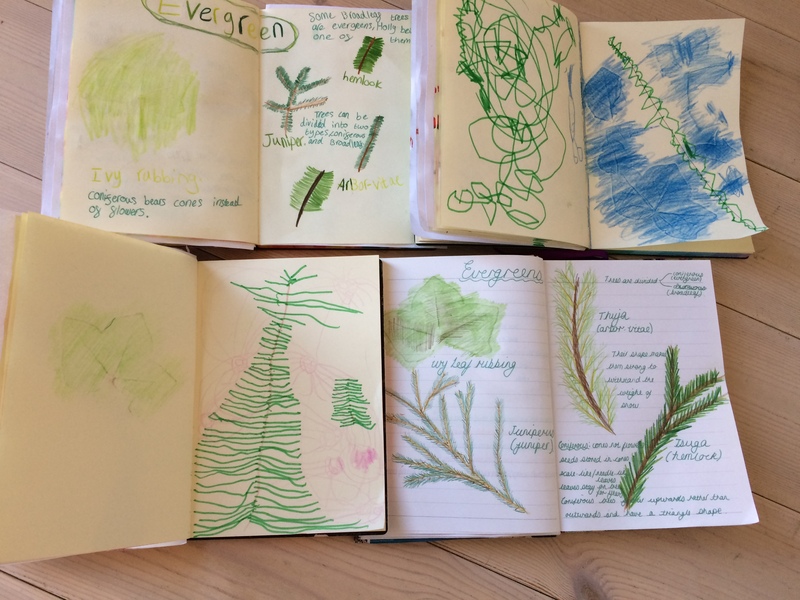 For our nature journal, we sketched three types of evergreen samples that we had collected. The weather is still far too cold for us to do our sketching out on our walks, so we are bringing the samples home to draw. After we’d drawn the different types that we’d collected, we tried to classify them and write that in. We also wrote some key evergreen facts into our journals along side the drawings. Something else that we added was an ivy leaf rubbing. Ivy is also evergreen, and leaf rubbing is an easy, popular, and very effective activity with the trio. Our recommended fiction read for the week was something I seem to have got in a muddle about, and I found a book in the draw differing from the suggested book. 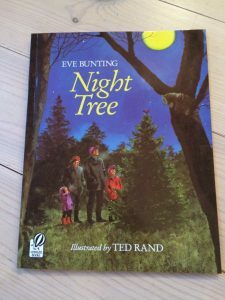 So we read “Night Tree” by Eve Bunting. 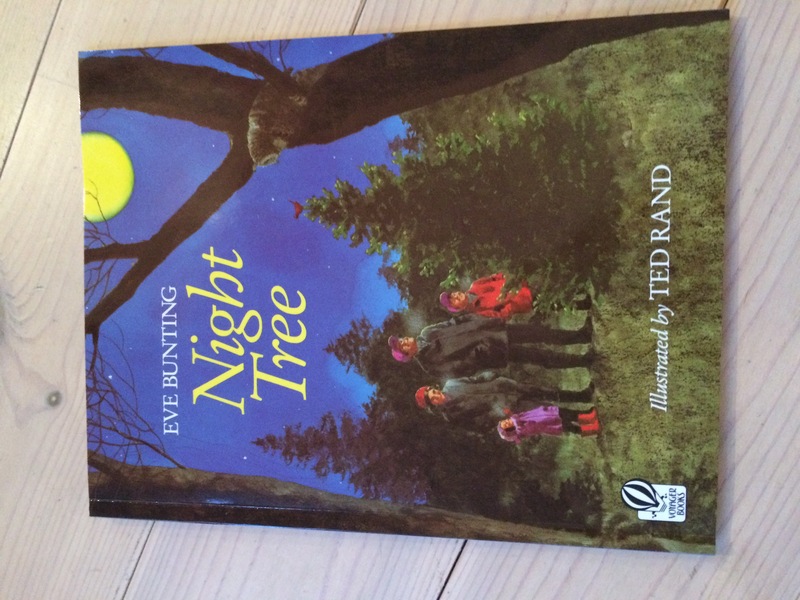 We really enjoyed this story and it has given us a great idea to do next Christmas. It’s about a family that goes on an adventure into the woods just before Christmas. They take with them, home made bird seed balls, satsumas, apples, and popcorn string. There they find “their tree” and decorate it under the moonlight with the food. After a warm drink they then return home, leaving the tree goodies as a Christmas feast for the forest animals. There is ample opportunity for us to that here, so I am going to try and remember about it. The suggested poem for the evergreen topic was “The Fir-Tree” by Josephine Preston Peabody, and the piece of art, “Fir Trees At Sunset” by Arnold Böcklin. 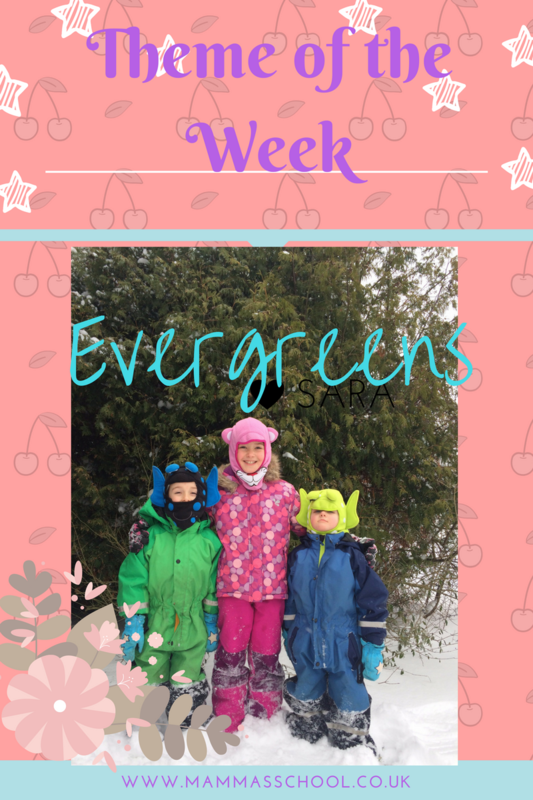 The Nature Curriculum we use is, “Exploring Nature with Children. A complete, year-long curriculum”. 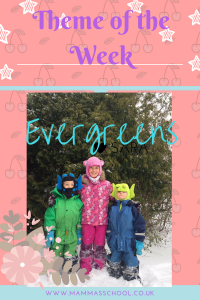 It is a beautifully written framework, written by Raising Little Shoots, and can be found over at https://raisinglittleshoots.com/ It suggests a topic for the week, and then provides some background information and suggestions for nature journaling and outdoor exploring. It also provides a comprehensive suggested reading list (fiction and non-fiction) for each week, plus a poem and a piece of art to study. There are extensions activity ideas too. We use the topic as the theme for our week, and follow the ideas for our journaling, and one fiction book. What we have been doing from the curriculum can be found on our curriculum overview post. The craft, science, maths, and English ideas we have researched ourselves to fit in with the theme 🙂 This makes a learning a lot more nature based. What a great subject, love the idea of the journals. 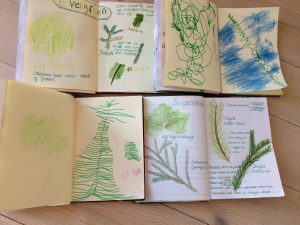 Love your nature journals! Also the idea from the book of taking something out as a present for the birds is cute too.